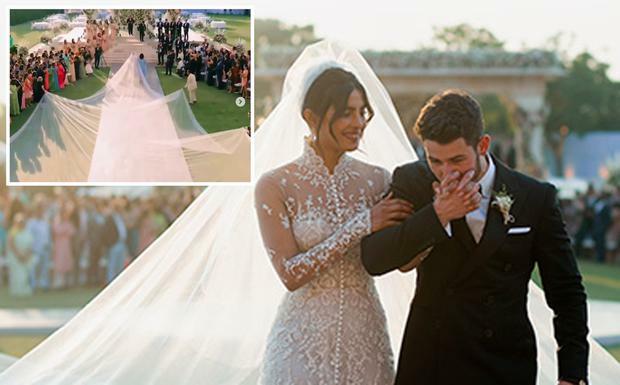 The bride wore several outfits over the course of her three day wedding to former Jonas Brother Nick, but it's her embellished white gown and dramatic veil that's getting lots of attention lately. Using the caption 'Once upon a fairytale', Baywatch actress Priyanka shared the incredible video showcasing her stunning Ralph Lauren gown, which had more than two million mother-of-pearl sequins sewn into it. While the dress was indeed impressive, it's her show-stopping veil that has captured the imaginations of fans and fashionistas alike - it was so vast it needed a team of five to carry it. Priyanka has clearly learned a thing or two from fellow newlywed Gwyneth Paltrow, who has mastered the art of the 'slow wedding dress reveal' with a steady stream of social media posts showing more and more details about the day as time moves on. The couple released several behind the scenes snaps of the festivities initially, before Hello exclusively revealed photos of the bride's dress for their western nuptials, while People has been given the honour of revealing extra details and videos of the day, including this impressive footage of the bride's fairytale entrance. Twitter has already been having a fun time comparing Priyanka's veil to a child's tent, and pitting its length against her friend Meghan Markle's veil - which was 16ft in length for her wedding in May. Nick and Priyanka - who have been together a relatively short seven months - tied the knot surrounded by their closest friends and family over three days of celebrations at the five star Taj Umaid Bhawan Palace in Jodhpur. In keeping with custom, groom Nick arrived to the Taj Umaid Bhawan Palace in Jodhpur - the same venue they had held their Western wedding - on horseback and wore a traditional outfit and turban, while Priyanka donned a red Sabyasachi sari. "I love that our wedding is a religious mash up," the bride exclusively told HELLO!. "We are taking beautiful traditions that we both grew up with and we are personalising them in a way that makes sense for us." She said: “It was all tears. All tears. I could not hold it in. I think I was nervous and scared. Jonas, 26, said: “The emotions were running high during the ceremonies, I think especially during the Western wedding for me.